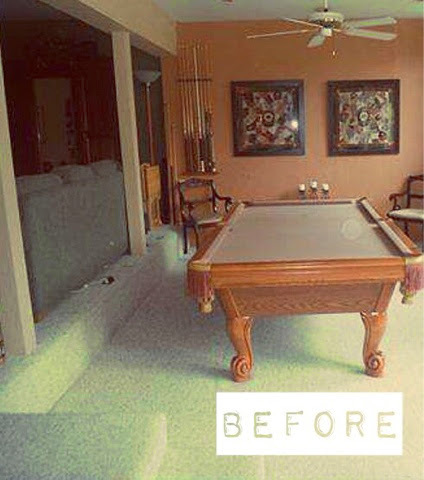 When we bought our house our current dining room was actually a pool table room. It had some nasty beige berber carpeting and taupe and tan walls. There also was no actual wall separating the living/family room which is a full step higher, they were using a couch as the divider. Since moving in, I've had a hard time fighting in many "this space should be a dining room" battles. And I've seen a few pool tables (with covers that could double as a dining room table), some pretty decent options - but they are hella expensive, more expensive than my table - so, for now, I get my dining room. We added in a half-wall to separate the living/family room space up above from the dining/sunroom space down below. 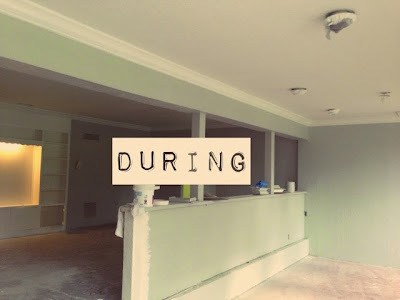 It seemed strange to be adding a wall when everyone is so obsessed with tearing down walls and creating open floor plans, but I wanted the dining room space to have a finished feel. Without the half-wall, we'd be staring at the back of our couch when sitting at the dining room table and I didn't like that idea. I love our dining room now. What about you? I love it. You did a great job and the added wall definitely completes the look! Hi Kathe! 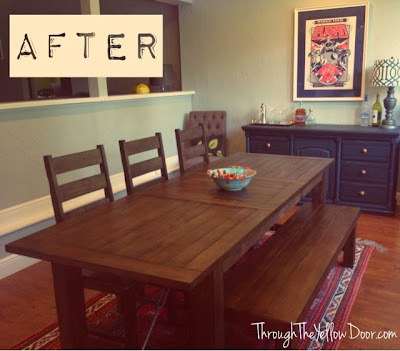 The table is so from World Market, so great we have similar taste!! Thanks for the shares and love! Room dividers can be great ways to add interest to boring decor and the best part is they are portable! So you can take a photo room divider when you get sick of seeing it in the living room and move into your bedroom. Either way, adding a photo room divider is sure to add unique interest to your home decor.